The New York Republican had suspended his campaign after the U.S. attorney's office in Manhattan indicted him in August for insider trading. 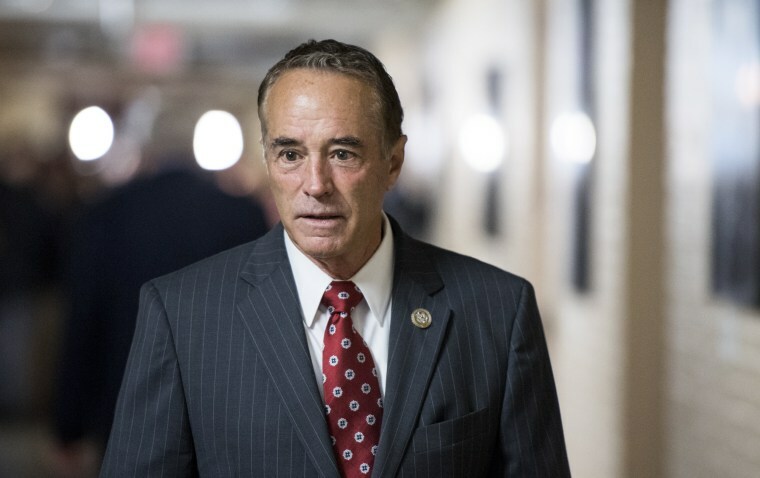 Rep. Chris Collins, R-N.Y., leaves the House Republican Conference meeting at the Capitol on June 20, 2018.Bill Clark / CQ-Roll Call, Inc.
WASHINGTON — Rep. Chris Collins, R-N.Y., will remain on the ballot in New York, despite being charged with insider trading and lying to the FBI, the National Republican Congressional Committee confirmed to NBC News on Monday. Collins had previously committed to work with GOP leaders and step aside for a substitute candidate to be placed on the November congressional ballot, according to The Buffalo News, which first reported the story. However, Collins feared election law challenges by Democrats could make the seat vulnerable if such a move was made, and decided to remain on the ballot, the newspaper reported. Collins, who was the first member of Congress to endorse Donald Trump for president in 2016 and represents New York's 27th Congressional District,was indicted in early August by the U.S. attorney's office in Manhattan for allegedly using his position with an Australian biotech firm to help his family make illicit stock trades — and avoid more than $768,000 in losses. His son Cameron Collins, as well as Stephen Zarsky, the father of Cameron Collins' fiancée, were also charged with insider trading. The men were also charged with lying to the FBI in interviews to cover up the alleged scheme. All three have pleaded not guilty. After initially vowing to remain on the ballot while fighting the criminal charges, Collins reversed course days later and announced that he was suspending his re-election campaign. Despite Democratic calls for him to step down, he said he would serve out the remainder of his term. However, Republicans faced difficulty in removing Collins from the ballot under New York State law. The only option was to nominate him for another office and have a replacement take his place on the ballot for his congressional seat. But the NRCC, the campaign arm for House Republicans, told NBC News that the only other office available was a judgeship, and Collins is not a lawyer. In New York state, there are only three ways for a candidate's name to be removed: death, disqualification or declination. The first does not apply, and disqualification only includes things such as residency and age requirements, but not criminal convictions. Collins would only face disqualification if he chose to move out of New York state. Collins is running against Democrat Nate McMurray, a local elected official. Mark Murray reported from Washington, D.C., and Dartunorro Clark reported from New York.